Google Penguin: What Happens Actually? This is known for most of us so I will keep this as short as possible. In this update we have seen that the fresh websites are not affected on Google search because these website don’t have much back links to talk about. Even the website which has some bad links is not affected much if the harmful links are less in ratio. The worst case in this update is that those website have dropped badly which were affected by any of the previous Penguin updates and didn’t recover till now. The solution which every SEO guru preached religiously and Google also suggested is removing the harmful links and making healthy links on high authority domains but we must take care of the theme, i.e. The healthy links should be from those sites only which are thematically similar to the website in question. Bear with me if I present a different theory here. You wouldn’t lose more than 15 minutes anyway. Link Removal: Lets forget the ideal sugarcoated SEO seminars and come down to this ugly world for a moment. We all are approaching webmaster or admin of the websites to remove the bad or unwanted links but I have seen that the success rate is very low. So we have an option to use the disavow tool to report it to Google and we do it, don’t we? Till date, I have created and uploaded at least 30 disavow files for 30 different websites in which not a single website has recovered. Please see the example, and yes this site didn’t recover an inch of lost ground. Yes, I know how to use the Disavow system and I am pretty sure I am doing it just like Google has prescribed. See a proof in case you are becoming suspicious. 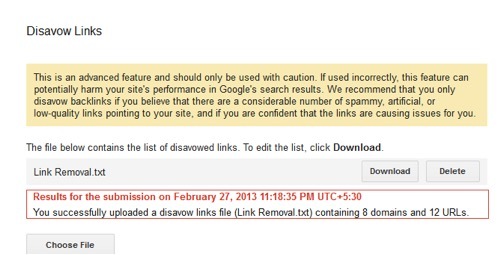 As you can see, I submitted disavow on 27th Feb 2013 and still harmful links are same which we had previously. The website has dropped badly after this penguin 5, even when we have made too many healthy links during this interval but website didn’t recover from penguin. Also I have sent reconsideration request to Google for the same websites using the Disavow details but result was same. Those sites didn’t get anywhere near their pre-Penguin rankings. So I still prefer to remove the entire harmful links manual and send reconsideration request for the same on Google Webmaster tool. In manual link removing I go by the old ways, which work wonder for me. Remove those links, which I can personally remove, all by myself. Continuously email those webmasters where I cant remove the links by myself. At least 3 reminder emails at an interval of 15 days or so. If it needs phone calling, yes I do that too. Sometimes, they may ask for a small payment, which I am not sure how much ethical, but I do generally pay them after a little negotiation. I call it an investment for for a greater gain. But I think there is nothing new here. So, lets just share what I think. I am working on this from the first Penguin update and found that only those websites have recovered in which we have removed maximum harmful links manually. 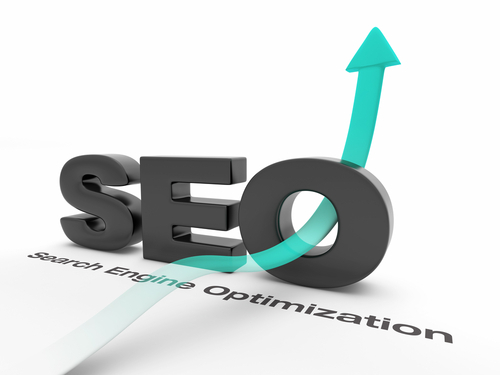 SEO gurus have spoken at great length what we should consider while creating new links. I never believed them at face value and often followed the (in)famous trial and error method. What I found out doesn’t match the words of those SEO gurus exactly. We should not take links on this as it has too many links on footer and seems spammy. Here we can take links on exact anchor text. In my personal experience, the second type links work wonderfully well. I will share a screenshot of such a client in a minute. If you have your client sites or your own web 2.0 property, then see the point 4 to get back links. In fact, we can get 100% links on exact anchor text in case if we are getting links from footer. But make sure the domain is not penalized by Google where you are adding links. Collectively the cumulative power trust of Money keywords should be max 50 percent if we are getting links in between content and reserve the 50 % average power trust for branding and generic keywords like click here, go here, author name etc. Getting links on related sites are very important. Don’t get links from irrelevant sites. I might sound self-contradictory here so let me clarify. From my own experience, I have seen, if you take links from a clean footer as a brand, it is not at all harmful. So, from any clean footer on client sites or any other web 2.0 properties, I personally don’t hesitate in taking back links, no matter how irrelevant they might be. See how the majority of the links are from the footer and still the site is ranking reasonably well. The client is happy with the ranking, and that matters most for us SEO guys. -Get links at footer on exact anchor text as mentioned in point 1st. -Every branding variation should target the homepage of the site. Which sites should you target to get links from? While most people would say vague words like, authoritative, clean, powerful sites, let me point out the exact objective values which I check before getting a backlink from any site. I have been hearing some great stories of how the Disavow tool is helping many sites but I couldn’t find it at all helpful. I would love to know if you have personally gained from using Disavow.